Click on the red titles with to follow links to interesting facts, information, places to see and places to visit. An apartelle (also Apartment Hotel, ApartHotel, Apart Hotel, and Apart-Hotel) is a type of accommodation, described as "a serviced apartment complex that uses a hotel style booking system". It is similar to renting an apartment, but with no fixed contracts and occupants can 'check-out' whenever they wish. Apartelles are flexible types of accommodation; instead of the rigid format of a hotel room, an apartelle complex usually offers a complete fully fitted apartment. These complexes are usually custom built, and similar to a hotel complex containing a varied amount of apartments. The length of stay in these establishment is varied with anywhere from a few days to months or even years. Prices tend to be cheaper than hotels. The people that stay in apartment hotels use them as a home away from home, therefore they are usually fitted with everything the average home would require. Metro Davao has been dubbed "The City of Royalties" (Dakbayan sa Dabaw) or "The Royal City." Davaoweños live by the King and Grandfather of the Philippine mountains (MT. APO), among the king of the Philippines skies and the largest eagle in the world (the PHILIPPINE EAGLE), the queen of the Philippine orchids (the WALING-WALING, Euanthe sanderiana), and feasting on the king of the exotic fruits (the DURIAN, Durio zibethinus L.). Some must-visit areas of the city include HOLIDAY GYM AND SPA (the most modern and complete spa, massage and fitness center), HOLIDAY OCEANVIEW RESORT AND MARINA SAMAL (the first and foremost marina being built in Mindanao) and CAMP HOLIDAY BEACH RESORT SAMAL (an exciting new outdoor camping concept). ASIAWEEK ranked Metro Davao among the 20 most livable cities in Asia, above Manila and Cebu and the number one as the most livable city in the country. AsiaBIZ Strategy conducted a study which named Davao City as the 10th "Asian City of the Future". Linmarr Davao is the pioneer who opened the door for families and out of town guests to enjoy the comfort of being at home and enjoy the ambience and services of a hotel. Linmarr Davao Hotels and Apartelles comes from the idea of living in an apartment, that is, your own kitchen, living room and even a garage. Yet, you enjoy the convenience of hotel luxury. 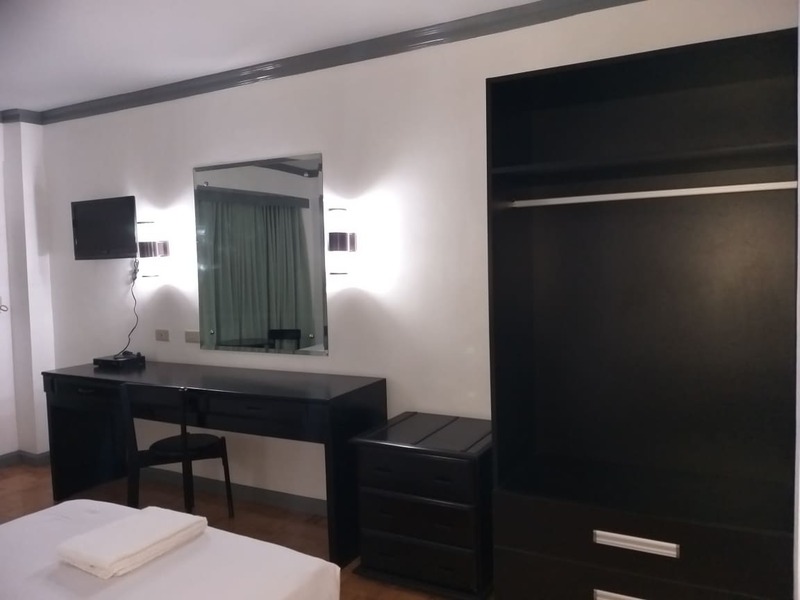 Linmarr Davao is conveniently located in a private, secluded and secured 9,825 square meter compound with high walls in the center of Davao City, Philippines with 34 apartment type units and 14 hotel suites. We have a conference hall that can accommodate 400 -500 people. Best place to hold wedding, engagement, anniversaries, etc. Our garden is full of tropical flowers and features the famous “Waling-Waling” orchids (unique to Davao). Our restaurant serves Philippine and international cuisine. The swimming pool area is located at the center of the compound, surrounded by plants and trees for total seclusion and privacy. There are two types of pools, a pool for children (8.5m x 7m, 60cm deep) and an adult pool (25m x 10m, 120cm deep). Built in April 17, 1996, Linmarr looks forward to extending our services as we aim for a broader clientele. Linmarr Davao has expanded by building an additional 13 Linmarr Suites and 1 Presidential Suite in 2000 to accomodate our valued guests. And NOW! an exciting new addition!!! LINMARR TOWERS - a condominium complex in Davao. 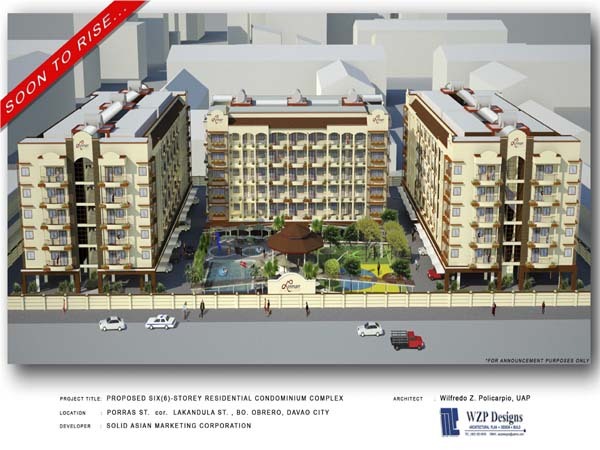 Located just beside Linmarr Davao Hotels and Apartelles along Porras Street corner Lakandula. Please follow the link above to find out more.